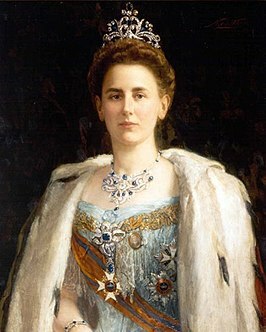 Today we are visiting the Dutch Royal Family Archives in The Hague, to be able to study the English letters the former Dutch queen Wilhelmina wrote to her governess Miss Saxton Winter. An edition of the letters was published in 2012, by Emerentia van Heuven-van Nes, but unfortunately they were translated into Dutch. So now we will have the opportunity of seeing the letters in the original. One of the questions we will consider is how good Wilhelmina’s English was, and perhaps also whether her English improved over the years. These questions are part of a larger ongoing research project on English as a second language (ESL) in the Netherlands, during the Late Modern period. The project: During the eighteenth century, there was considerable interest in the Netherlands in English literature and other writings in that language, but actually learning English was not easy. English was not as yet a subject that was taught in schools, nor were textbooks such as grammars and dictionaries easily available for learners. Most problematic of all was the general lack of native-speaking English teachers (Tieken-Boon van Ostade 2012). Yet various people managed to acquire the language and become quite skillful in writing in English. One of them was the Frisian clergyman Johannes Stinstra (1708-1790) who had translated Samuel Richardson’s novel Clarissa into Dutch. Another was the Leiden Arabist H.J.A. Schultens (1749-1793), who (unusually for a foreigner) managed to obtain an MA degree from the University of Oxford. And Belle van Zuylen (1740-1805) was yet another learner of English, whose skill in the language as far as I can tell was quite considerable. Kastelein, Emma (2014). I shall find you quite an Englishman? Hendrik Albert Schultens 1749–1793 and the learning of English as a second language. Research Master thesis, University of Leiden. Sario, Anni (2014). Code-switching in Late Modern L2 English: the Autobiography of Joseph Emin (1726-1809). Paper presented at the conference Historical Code-Switching: The Next Step, University of Tampere, 11-13 June 2014. Tieken-Boon van Ostade, Ingrid (2012). Late Modern English in a Dutch context. English Language & Linguistics 10/2, 301-317. Verschuure (2012) ‘We therefor did not the draft’. The importance of English and English language teaching and learning in the Netherlands in the eighteenth and nineteenth centuries. A case study. Master thesis University of Leiden (for a summary, see https://latemodernenglishletters.com/2012/09/19/late-modern-dutchmen-writing-english/). This entry was posted in 18th-century letters, 19th-century letters and tagged Belle van Zuylen, English in the Netherlands, LSE, Queen Wilhelmina. Bookmark the permalink.